Phoenix is hot in July. Please send my "Captain Obvious" certificate to the e:mail address at right. I left for the airport yesterday morning at 5:00 a.m., and I got home yesterday evening at about 9:45 p.m.. Why, yes, I was quite tired, thank you for asking. My meeting went reasonably well given the circumstances, but in keeping with my policy of keeping my business life out of my personal blog, that's all I'm going to say about that. One thing I am going to talk about is the topic of women's shoes. When I was getting dressed yesterday morning, I initially put on the 3 inch heels that matched the suit I had selected. After about 2 minutes in those, I made a command decision to put the pumps in my backpack and wear my Danskos for the trip. I HAVE NEVER BEEN SO HAPPY WITH A DECISION IN MY LIFE. By the time I got home, my feet were a bit swollen, and just imagining wearing those pumps for eighteen hours made me want to cry, although that might have been exhaustion. The three hours I did actually wear them was more than sufficient, thank you very much. I really like high heels, actually. I like the way they look, I like the way they extend the line of my leg, and if I'm wearing a skirt, I like the way they make my legs look. But for traveling? I'm sticking my high heels in my backpack and going with the frump shoes from now on. And there's a bonus - they're perfect for airport security. Smart choice! 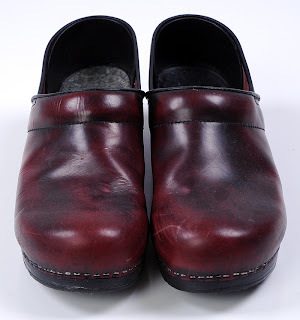 Except Dansko clogs & similar adds almost 3 inches of intimidating height to my 6' frame so I try to stick w/flat soled comfy shoes when I travel. Regular commenters The Mechanicky Gal and Kate Baker have similar troubles. Me, not so much, since I'm short on one end. Michelle, they sell them at The Walking Company, and there's a store about 15 miles from here. We can certainly go look when you're here. But Michelle - SO WORTH IT!!! I was having foot issues, you know, the arches, plantar fasciitis pain, all that crap. Got the Dansko's and all is well wit' mah Dogz now! Yes they do add height, but for us Tall Galz, we're kind of used to it by now, aren't we? Tall Galz? Yoo-Hoo! You out there? Janiece, I have lots of problems finding shoes that fit properly, so I'm used to paying a significant amount of money for quality shoes. Same here. After 20 years in retail standing and walking on concrete floors 8-12 hours a day, my feetzies is toast. And I know there's a Walking Co here in Atlanta someplace. Plus the extra few inches wouldn't hurt! I just wear a heavier sock, and comfort is mine!